Three judges are in my mind today. They are the creations of literary craftsmen of the Twentieth Century, and each does his judging in the context of a ‘Christian’ social order, a small town of ‘middle-America’. Each knows his Bible backwards and forwards, each quotes it with zest, and each dispenses mercy from the bench. Each is comfortable speaking in church, and one gives one of the great sermons of the Century, both in print and in the movies. Yet each struggles with ‘church’. The most Christian of these men doesn’t go any more; the Lutheran one goes but keeps his skepticism to himself; and the third is Senior Warden of his Episcopal church but is trying hard to rotate off the Vestry. Whom are we talking about here? We’re talking about Judge Billy Priest, the hero of once popular short-stories written by the Kentucky-born humorist Irvin S. Cobb. We’re talking about Judge Schlichter, the man who taught Colonel Ross, the hero of James Cozzens’ novel Guard of Honor, everything he knows. And we’re talking about Judge Lowe, the Senior Warden of Christ Church, Brocton (PA), who presides for the county and is both brilliant and compassionate. Judge Priest, who is as Christian a character as you’ll find in American popular fiction of the post-World War I, pre-Depression era, is a priest, de facto, to just about every person in the town of Fairfield, KY. You can read all about it in short stores such as “The Lord Will Provide”, “A Beautiful Evening”, and “A Blending of the Parables”. But Judge Priest will never be found in church on Sunday mornings. Through careful and quiet deceptions, most of them in the service of the good, William Pittman Priest manages to create an excuse not to go, just about every Sunday of the year. And that’s in a Kentucky town where absolutely everyone has a church connection of some sort — or what the movie Bonnie and Clyde called a “church affiliation”. 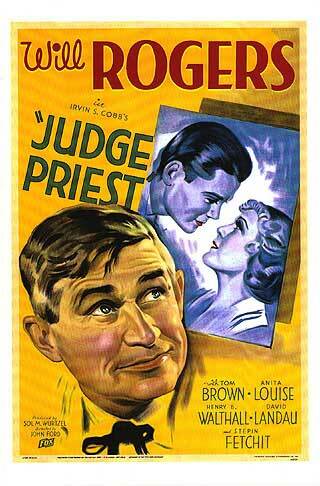 You need to know that Will Rogers played Judge Priest in the movie entitled, wouldn’t you know, Judge Priest, directed by John Ford. John Ford himself was so taken with this pastoral figure of Protestant Grace, Judge Priest, that Ford made a second movie based on the Irvin S. Cobb character, entitled The Sun Shines Bright. (Ford placed Cobb himself, the great man, in another movie of that era, Steamboat ’round the Bend.) You can see that one day long ago, Judge Priest was important. He played the part of the merciful Judge, for whom forgiveness readily trumps exaction. Though he didn’t go to church. Judge Schlichter, who is described at some length in a digression late in the body of the Pulitzer-Prize winning novel Guard of Honor, is constantly quoting Scripture on the bench, and to his clerks and staff — and is sincere about it. 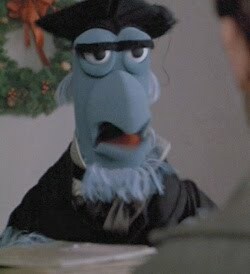 Judge Schlichter does attend the Lutheran church, every Sunday, more or less, of the year. He lectures a notorious atheist who will not take the oath on the Bible, and almost puts him out of his court. Schlichter is quite sly and misses nothing. He is the terror and the god of all who know him, and love him. But Cozzens wants to tell us that Schlichter treasures considerable disillusionment in his heart, and has no sympathy for Pharisees. He keeps some liquor deep within the safe in his chambers, and is happy to have his nip (as is Judge Priest) when the right people are around, or, rather, when the wrong people are not. Judge Schlichter values Christian civilization, and especially John Milton, but is not convinced, we could say, about the Holy Spirit. Judge Lowe, a compassionate and benign man, also a scholar and historian, reigns in the Brocton County Courthouse of Cozzens’ By Love Possessed. Monday nights once a month he is right as rain in the Vestry meeting of Christ Episcopal Church. He has served several years as the Senior Warden of the parish, and is the ‘grand old man’ of the congregation. Almost every Episcopal church used to have a Judge Lowe. They were thoughtful, prudent, dear, watchful, wise, constant; and you never knew exactly what they believed. But it didn’t really matter. You needed a Judge Lowe — how about five! When everyone else was running around panicked about something, or hip-deep in a battle over nothing, or tiring out the rector with innumerable complaints concerning tertiary questions, you could go to ‘Judge Lowe’. He would intercede, he would mediate, he would reconcile, he would comfort, he would assure, he would ‘make it happen’, whatever it was that needed to happen. Not many churches have their ‘Judge Lowe’ any more. Such people don’t go to church the way they used to. ‘Pillars’ like that no longer think it their duty to help prop up the local church. It doesn’t go quite with the job, the job of being wise and PBS ‘News-Hour’ sententious, the way it used to. 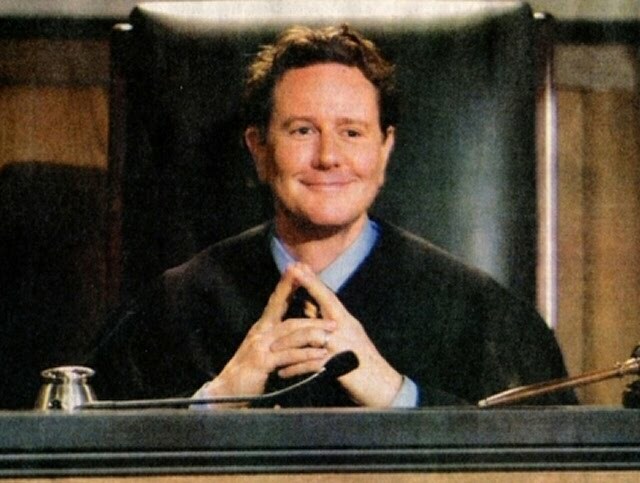 Most of our ‘Judge Lowes’ are sitting it out these days on Sunday mornings. Not to mention Monday nights. Seriously, the more is our loss. In By Love Possessed Judge Lowe is trying hard — and it’s only 1957, for crying out loud, not 2010 — to retire from his church position. He doesn’t know ‘what it all comes down to’ any more, or what it ‘really means’. He is talking about church. He has lost his faith in ‘church’. What will happen is that Judge Lowe will stop being Senior Warden. He will start seeming to be ‘scarce’ Sunday mornings, and ‘unaccountably’ he will start making excuses about his needing to be available to family, or needing to be out of town for one thing or another. In fact, Judge Lowe will probably be reading the Sunday paper at home and poring over his beloved history books. Maybe like another hero, ‘Uncle Tim’ in Cozzens’ last novel, Morning Noon and Night, our man will spend the rest of his leisure time re-reading Dickens’ Dombey and Son. This ‘Uncle Tim’ becomes one of Cozzens’ more memorable characters, by the way, because even while he becomes the “re-reader of Dombey and Son“, he is far-sighted enough to save his extended family’s entire financial holdings before the collapse of the Stock Market in 1929. Three judges I show you: all fine men, all compassionate men, all far-sighted and wise-minded men, all Christian men in formal terms, and one of them, Billy Priest, the very embodiment of Grace in his handling of all sorts and conditions of men and women. But they are all struggling with church. Not one of them is getting much from church. Shouldn’t we be trying to do something about this? If we lose our Judge Schlichters, Priests, and Lowes — and we have lost a ton of them — who is going to be left? And what were these fine people not hearing on Sunday morning that might have kept them hopeful, and warm, and trying? You are absolutely right. I see the Emergent Church as a response; I see Michael Spencer's IMonk site as a response to name two I can think of. I think your site is a response. The Evangelical Church seems like a cross between the Pharisees and the Essenes. I believe more and more people need The Gospel and God's grace, but they are not getting it. This is not an easy question to answer. I would say that it has something to do with the office of being a judge, but since these men are not unique in their aversion to church this seems unlikely. Perhaps with Schlichter, it is a question of whether he was really in touch with themselves and the Christian Gospel. Almost a Christianity that exists in theory for himself, in praxis for other people but never the twain shall meet. For Priest, maybe the Church as an institution represents a taming of something that is at its core dangerously subversive and unfettered grace. As if the incessant activities of the church community simply reflect conventional Midwestern life. It's possible that, for Lowe, church as an institution represents some sort of ought or obligation. It's the weight of being a pillar on the vestry. Church has become a role that he must play which he does not want to play anymore- and who could blame him? Many emergent types will rightly talk about how church isn't an institution. But their counter proposal that church is a community fails to recognize that it is a community created and invigorated by the word of grace.